The largest expanse of vineyards in the Rems valley, Germany's second most beautiful village, the birthplace of Friedrich Silcher, the region's most traditional festival: Weinstadt has a whole series of accolades to its credit. Yet though the town is located in the middle of the Stuttgart region, it has in most respects lost nothing of its idyllic quality and rural charm. Weinstadt lies right in the heart of the wine-growing area of the Rems valley, surrounded by the wooded slopes of the Schurwald, extensive orchard meadows and vineyards. Its 26 000 inhabitants live in Beutelsbach, Endersbach, Großheppach, Schnait and Strümpfelbach, five communities with a long tradition of wine-growing, which in 1975 amalgamated to create the municipality of Weinstadt. They look back on a wealth of history, to which many of their buildings still bear witness today. The exquisite wines from the cellars of private producers and the winegrowers' cooperative enjoy an outstanding reputation far beyond the bounds of the region and indeed Germany. Picturesque scenery, viniculture, excellent and varied cuisine and a host of merry and sociable festivals account for Weinstadt's popularity, both as a place to live and for relaxing outings. Some of the special highlights that attract visitors from far and near include Weinstadt's Song Trail, "From Friedrich Silcher to Gotthilf Fischer", and the three Sculpture Trails with works by Weinstadt artists near Strümpfelbach and Schnait. During a circular walk visitors can enjoy art, nature and traditional folk songs at the same time – a unique and unforgettable experience. Or come and visit the town's numerous vaulted cellars where once the old wooden wine barrels were stored and locals and guests now celebrate the annual "Night of the Cellars" with wine and music. A settlement founded around 1080 in a tributary valley of the Rems on the banks of the Schweizerbach: little did Konrad von Beutelsbach suspect that he was to be the first in a line of lords, counts, dukes and – much later – even kings, who would go down in history as the Royal House of Württemberg. 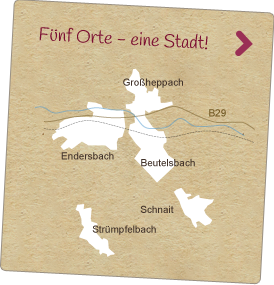 To this day the former village of wine growers is still known as "The Cradle of Württemberg". Nestling among the slopes of its vineyards, Beutelsbach boasts not only excellent gastronomy but also numerous sports and leisure facilities. Music fans meet in the vaulted cellars of the "Armer Konrad" jazz club for the weekly "Donnerjazz" and other music events. And in Beutelsbach wine lovers will find several privately-run wine estates as well as S. Germany's largest barrel cellar at the Remstalkellerei. According to legend, in past centuries the vintners of Strümpfelbach stole from the vineyards of their Endersbach colleagues the wooden stakes used to support the vines. To put a stop to this annoyance, the crafty wine growers of Endersbach wedged peas into the bottoms of their stakes. When spring arrived, the peas began to sprout – visible proof that the stakes in Strümpfelbach's vineyards were actually the property of an Endersbach vintner. Ever since, the people of Endersbach have been nicknamed "Erbsaglemmer“, or "Pea Wedgers", a term that crops up again, for example, in the name of the annual Nordic Walking race, the "Erbsaglemmer-Lauf". Though there is no written proof of Endersbach's existence prior to the 13th century, there is more archaeological evidence of earlier settlements here than anywhere else in Weinstadt. Today the townscape's main architectural landmarks are still the historic church, the town hall and the former tithe barn. Thanks to Endersbach's favourable road and rail links to other transport networks in the region and beyond, it has over the years evolved into the urban centre of the municpality. Großheppach. A place with a turbulent history and exquisite wines. The church tower of St. Aegidius (St. Giles) in Großheppach, situated on the fluvial plain near the R. Rems, is visible from afar. Topped by a so-called bulbous cupola, it gives the church and thus the townscape in general their distinctive appearance. Next to the church is another of Großheppach's landmarks: the castle. This village of vintners on the north bank of the Rems looks back on a turbulent history. During the "Poor Konrad" uprising in 1514, peasant revolutionaries gathered on Großheppach's fields. In the Thirty Years' War it was the site of a battle between imperial and Swedish troops at the bridge over the Rems, where some 200 of the emperor's men lost their lives. In the War of the Spanish Succession, Großheppach once again played a central role in the commencement of hostilities. On 13th June 1704 the greatest military leaders of the day – Prince Eugene of Savoy, the English commander-in-chief Marlborough and Margrave Ludwig of Baden ("Turkish Louis") – held a council of war on the impending Battle of Höchstädt (Battle of Blenheim) at the "Lamm" inn, which was still in business up to a few years ago. Schnait. Three Castles and Friedrich Silcher. Schnait, idyllically located in the Schweizerbach valley, is known beyond the region first and foremost as the birthplace of the composer Friedrich Silcher. The three Gaisberg castles dating from the 16th and 17th centuries bear architectural witness to the somewhat complicated history of the town's governance, which was marked by division and a succession of different rulers. The townscape today is dominated in particular by the mighty double complex of the "Unteres Schloss" (Lower Castle). The Upper Castle in the Haldenstraße, also known as the "Schafhaus", is now a private residence. Another endowment of the Gaisberg family, the magnificent winged altarpiece dating from 1497 in the parish church, is probably Weinstadt's most important work of religious art. Besides several imposing timbered buildings, the courtyard of the former monastery in Kostobel is especially worthy of note. Strümpfelbach. Magnificent timbered buildings, art and culture. Typical of Strümpfelbach, Weinstadt's smallest community, are its romantic location among the vineyards and orchard meadows and the splendid timbered buildings lining its narrow streets and alleyways. The vineyards and the timbered houses are closely linked: most of the buildings here were erected by vintners who built imposing dwellings with characteristic cellarway entrance portals to underline their affluence. Viniculture is already the theme of the first written evidence of the hamlet's existence in a document dated 1265, when vineyards in "Striumphilbach“ were gifted to Salem Monastery. Strümpfelbach was most probably founded as a settlement for vintners by the older village of Endersbach, which is why they counted as one municipality up to the 16th century. The famous conflict between the two communities over the ownership of a forest, settled in 1793 by Duke Carl Eugen of Württemberg, has its roots in these common beginnings. The Karlstein (Karl's Stone) on an outcrop of rock between Endersbach and Strümpfelbach commemorates this dispute and is today a popular place for outings. The numerous timbered buildings, a uniquely coherent ensemble exemplifying the skilled carpentry of the Early Modern period, are second to none in Württemberg and have won many awards for this wine growers' village. Also worthy of note is the parish church of St. Jodok (Jodocus), a Late Gothic choir tower church from the late 15th century with precious wall paintings. In addition, one of the winepresses built in the 16th century is still in existence and is now used as a centre for cultural events. The town is also known further afield for the legendary "Gretle of Strümpfelbach", the heroine of a Swabian play first performed in 1914.